Please be gentle with me as I am new to youview and this forum! 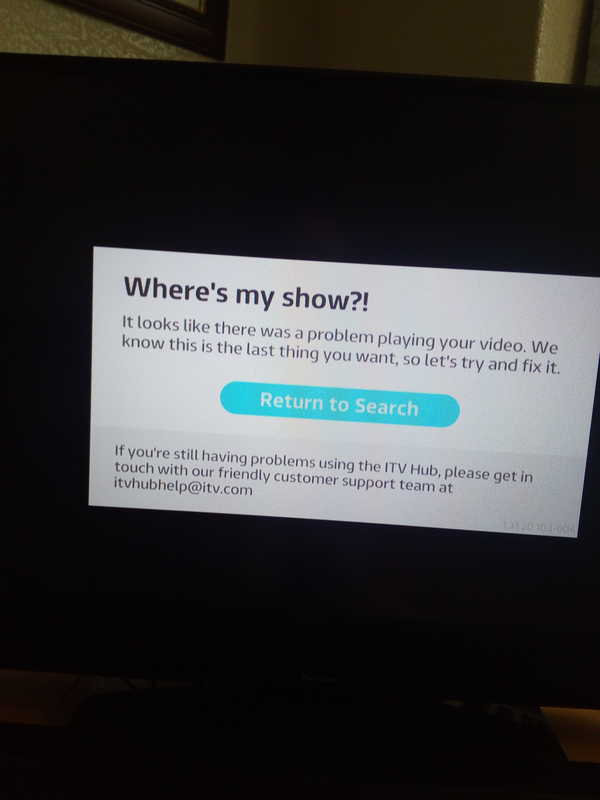 I am having a problem with the itv hub on my youview box, whereby it will find the programmes but when I press play, the video fails to play and an error message appears. The itv hub is version v1.31.20+188 and the youview box is a Huawei dn370t.02.04.p with software versions: component software 3.3.156(d1228a) - manufacturers software 70.45.159 - platform configuration 4129 and isp configuration 21108. Interestingly I have a similar youview box upstairs, with the same software versions and the same itv hub version and that plays OK! The box with the problem is connected to the Internet, as I have tried other catch up apps (eg BBC iplayer) and they work fine. I have also tried a soft reset of the box and signing out and back in of the itv hub. Greetings @Alsatian and welcome to the Community! An excellent set of background information - I wish everyone would do this on a first posting - lacking only what the exact error message was. But that may not matter overmuch. Smart stuff: The trick is probably that you need to empty the app cache, which you can do separately on the Sony YouView TVs, but not on the boxes, AFAIK, if a soft reset doesn’t do this. A Maintenance Mode Reset might do it though; a bit more drastic than a soft reset, so be forewarned by reading the instructions there. I recommend Option 2 in the first instance, which is the gentlest MM, and does, all-importantly, at least keep your recordings. Thanks very much for your quick response and your welcome. I've attached an image of the actual error message if that is helpful. After selecting the program the player plays a couple of adverts, before showing the error message. Also I forgot to mention that it is a brand new box, and was bought sealed from the Internet (a well known auction site!) and has only been used for a week. Would the maintenance mode reset still be a viable option with the above in mind? Can you let me know if this error happens on all pieces of content you try on the ITV hub or just on certain programmes? Also just to confirm, the same pieces of content work on the other YV box you have? In answer to your questions, yes it happens on all the programmes I have tried (I tried recent programmes and also programmes 2-3 weeks old). And it was the same programmes that I tried on the other youview box, that played successfully. Thanks for confirming this for me Keith. I'd suggest giving what Roy suggested a go to see if it changes anything as it could iron out any issues which are going on. I assume the other players on the same box are all working as expected? Thanks very much I'll give it a go tomorrow when I've more time, and let you know the outcome. I checked the other catch up apps (as previously I'd only checked BBC iplayer) and neither all4 my5 or uktv played either! I rebooted the router, swapped the box with the one that was working, none of which cured it, so it was obviously a box problem. I then followed the advice and performed a maintenance mode reset, firstly did a software reset, which made no difference, then a factory reset (including deletion of all recordings)........ hey presto! All the catch up apps are now working. Thanks for the update. I'm sorry to hear that it took the factory reset which deletes your recordings to fix but I'm glad that they're all working as they should, hopefully it stays that way! Thank you, but hopefully it's fixed permanently! I'm a recent convert to youview, having come over from the dark side that is freesat. I've always felt the poor relation of sky (I refuse to pay their prices) and we recently lost 4hd and all4 from the freesat platform. I have 2 humax freesat hdr recorders that are now getting on in years and will soon need replacing at an exorbitant cost. I was given a youview box to try, and was so impressed I bought another! The boxes, especially when paired with the youview app, are so intuitive and it's so easy to do whatever you want to do, also there are far more features than freesat. I also think that the pictures are cleaner and 'warmer' than a satellite picture. The only compromise I've had to make is that we live in a freeview 'lite' area and only get around 20 TV channels. This is a small compromise when compared to all the advantages.